To behold her sweet, angelic countenance, it’s hard to imagine this author could be capable of such naughtiness. But I suppose it’s further testament of Linda Ashman’s brilliance that she was capable of creating the nastiest, most obnoxious brats in the history of alphabet books. Just one more reason to love love love the work of one of my favorite children’s authors working today. You may wish to keep a safe distance from the “guest” Linda has brought along to the Potluck. Catastrophic Coco has stepped out of the pages of Linda’s cautionary collection of miscreants, M is for Mischief : An A to Z of Naughty Children (Dutton, 2008), which as some of you may remember, I was brave enough to review here. Though I’m a little nervous at having Coco in my kitchen, I admit to finding her oddly irresistible, as I do the other 25 characters in the book, which is an unforgettable feast of alphabetical disorder. While Coco’s busy cooking up chaos, I’m going to fill up on Linda’s tempting dish. Linda: I started writing this book eons ago when my son Jackson was two years old (he’s 14 now). He really enjoyed stories and poems about bad behavior, which gave me the idea for a collection about naughty kids. I thought it would be fun to organize it around the alphabet, using lots of alliterative words for each poem (I spent a lot of time with the dictionary while working on this project!). This one is Jackson’s favorite. In fact, he just recited it the other day. Clobbered Curtis with a carp. Crashed a kayak in the lake. Called the counselor a cow. Coco’s cab is coming now. Our family doesn’t eat meat, so I’m always looking for easy, tasty and relatively healthy recipes. I adapted this one from a recipe I found in Vegetarian Times magazine. It’s our standard potluck dish, and even avid carnivores seem to gobble it up. I’m not a precise cook, so these measurements are approximate. Feel free to adjust to your own taste, and to use other greens (it’s great with Swiss chard and kale, too). Cook orzo according to package directions. Drain and set aside. Meanwhile, sauté onions in 1½ Tbs oil in a large Dutch oven until soft and beginning to brown, about 10-15 minutes. Add garlic and cook another minute or two. Add the spinach and sauté until wilted, about 4-5 minutes. Stir in the vinegar and olives and remove from heat. Add the orzo to the greens, along with the remaining olive oil, lemon juice, and feta. Mix in the toasted pine nuts, and season with freshly ground pepper and salt to taste. Linda Ashman is the author of more than two dozen books for children, including most recently Samantha on a Roll, illustrated by Christine Davenier, a New York Times Notable Children’s Book of 2011. Her picture books have been included on the “Best of the Year” lists of Parenting, Child, and Cookie magazines, The New York Public Library, Bank Street College of Education, and more. She lives in Denver with her husband, Jack Hicks, their son Jackson, and their two rascally mutts, Sammy and Stella. Learn more about Linda and her books at lindaashman.com. Previously: Menu/Giveaway/Door Prizes, April Pulley Sayre, Mary Quattlebaum, Helen Frost. *Spreads posted by permission, text copyright © 2008 Linda Ashman, illustrations © 2008 Nancy Carpenter, published by Dutton Children’s Books. All rights reserved. Coco’s counselors are grateful that the cab is arriving not a moment too soon… hah! Oh yes! It only takes one . . . I love the expressions on the faces of people who are interacting with Coco, like the kid who wants to brush his teeth. And the counselor, who is trying to be all mature even though he’s got arrows stuck to his bottom. And poor Curtis! Looks like a fun book to read with my tutee. It’s definitely a fun book. Kids love to live out their wildest fantasies. Well maybe they’re not really fantasies. 😀 Did you read how she crushed a cake?! Luckily she was too preoccupied with the bears to do any real damage to our kitchen. Curtis and the counselor may wish to cook Coco according to package directions. I, however, will try Linda’s recipe as suggested with orzo. LOL. “cook Coco.” Doesn’t that recipe sound delicious? Will have to make it soon. Sounds tasty and light. I should use pine nuts more often. They’re definitely yummy and add that certain extra something to a dish. More wicked fun for Poetry Month! Thanks for sharing, Jama and Linda. (And I might point out that our vegetarian kitchens are obviously safest – no carps lying about to use for clobbering.) The orzo dish looks delicious. LOL. No carps, but what about those giant eggplants? I know I will love the orzo dish, have used spinach & feta with pasta other times too. I have loved No Dogs Allowed in the past, & am happy to see this new and mischievous alphabet book. Thanks Jama and LInda for a good laugh this am. Thanks so much for including me, Jama. 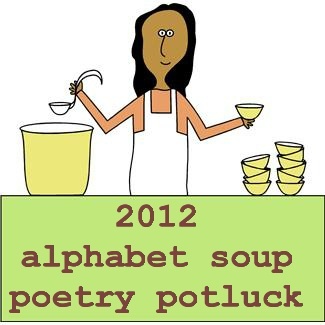 I’m so enjoying this first week of your Poetry Potluck, and can’t wait for more! Thank YOU, Linda, for bringing such an “interesting” guest to the Potluck! Always good to have a little excitement to keep us on our toes :). Hey, Jama! ANOTHER great post! I love the pic of Coco being carried off – LOL! She does not look too upset about it. I make orzo really often — never tried it with pine nuts though; looks good! Linda does look angelic, doesn’t she? Very pretty! And I love the book cover of M is for Mischief! I hope we have it in our community library here. Will definitely try the orzo with spinach (my mouth is watering now) – lovelove pine nuts and feta cheese and olives!!! You’ll enjoy M is for Mischief. Hope your library has it! A heart healthy way of going about your day with some tight children’s rhymes thrown in. Doesn’t get much better than that. Absolutely right. I’m sure even Coco would agree with your comment, Charles :). I love Linda’s poetry and picture books in verse. One of my absolute favorites is “Castles, Caves, and Honeycombs.” It’s one of the books I always give as a gift to parents of newborns. I make an orzo salad similar to yours. It doesn’t have spinach or pine nuts–but it does include grape tomatoes, chopped sweet red pepper, and diced cucumbers. Linda, your Orzo Salad was the star of my Easter feast! The recipe is now safely bindered in my book of clippings. Thank you!